The list of cities and state opting for double-digit minimum wages seems to grow by the week. The New York State Assembly is considering a statewide wage floor of $15. If it doesn’t happen in New York, it will happen somewhere else: After decades of bewildering silence on the issue, income inequality has become both a dominant political topic and—even more surprising—good politics for elected officials counting votes. The Fight for $15 campaign stands out for converting a seemingly outlandish political goal into common sense, and doing so in the short space of three years. 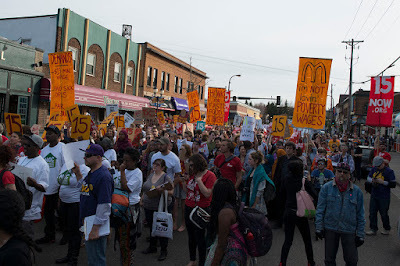 Yet to take the next step to improve lives and match the reality of work with our collective expectations of it, Fight for $15 will need to succeed at the much harder task of naming and responding to the many workplace inequalities that low-wage earners suffer in addition to poor hourly pay. The campaign and the workers driving it have recognized this from the beginning, but the task they face is tremendous: Convincing policymakers and members of the public who haven’t worked a low-wage job in the past decade who are unlikely to believe the problems entry-level workers face. This problem can be seen most readily in the growing practice of just-in-time scheduling. When I was conducting fieldwork for Degraded Work in the mid-2000s, a small number of the workers I interviewed told me of their frustration with arbitrarily cancelled or shortened shifts. A butcher in a Chicago supermercado explained that on slow days, or during a storm, he’d be sent home a few hours early, then told to report ahead of time the next day. This unpredictability constantly upended his attempts to arrange childcare and keep a second job, but there was nothing he could do about it. Aggregating his experience with related details about “three strikes” dismissal systems, punishment for taking bathroom breaks, and other micro-level degradations on the job, I reached the conclusion that employer experiments with labor control were proliferating. Today, nothing about this arrangement could be classified as experimental. In the years following the recession of 2007-2009, employers insisted on erratic scheduling as a matter of policy. Job seekers began reporting that “open availability” (the ability and willingness to work any shift, on any given day) was a prerequisite for landing a retail job. Human-resources software packages now alert managers to dismiss workers early when weather or sales amounts compare unfavorably to benchmarks. The havoc this unleashes in workers’ lives is extraordinary. But more to the point, it’s complicated: Some workers spend hours taking public transit to the job, only to be sent home before the shift starts. Others forego sleep and reliable child care in an attempt to hold multiple jobs. And just about everyone finds that the uneven weekly cash flow means there’s no way to stave off debt, much less dig out from under it. While low wages have a single measure, scheduling and the dozens of other problems workers face on the job are context-specific and heterogeneous, and they have a lot to do with hamstringing life after the shift ends. Attempts to describe them cannot come close to the simplicity of fighting for $15. This is a real problem. We have good data on wages and on hours, at least for a person’s primary job. We can say some things about people looking for more hours. But the measures of erratic scheduling’s toll on human beings come from interviews. And even by the standards of interview data, they’re narratively complex – seemingly designed to resist the compact measurement that makes policy problems legible. As Fight for 15 pivots to the problem of scheduling, it also faces the challenge of stepping outside of professionalized discourses about work. Pay remains the simplest, most elemental measure for a job. It’s an especially good measure of the compensation of professional work, which generally has regular (albeit, often long) hours, health insurance, dental plans, and retirement packages. But for low-wage workers, everything is negotiable all the time, including actually collecting the pay promised for work. The lived experience of work differs so much for professionals and low-wage workers. Beyond the challenges of numerical expression and narrative simplicity, raising support for reforms to job quality faces the challenge of conveying a workplace that few of the professions who make or legitimize policy have experienced. There is hopeful precedent for giving voice to problems like these. During the fieldwork for Degraded Work, I worked a lot for a Chicago Worker Center whose members organized impromptu delegations to press construction contractors to pay wages they had wrongfully withheld. We called the problem “robo de salarios.” Today, wage theft is a recognizable social problem, a plague understood to be much more systematic and amenable to legislation than our efforts to chase down a few unreliable construction contractors would have indicated. It’s a source of legal claims, and a way to organize workers. None of this is to suggest that Fight for $15’s wage victories were easy, or that it has paid scant attention to these problems. They weren’t, and it hasn’t. But one of the many benefits to the campaign is that it allows us to look beyond wages, to the many other important things that unions do and need to do today. Marc Doussard is assistant professor in the Department of Urban and Regional Planning at the University of Illinois at Urbana–Champaign. 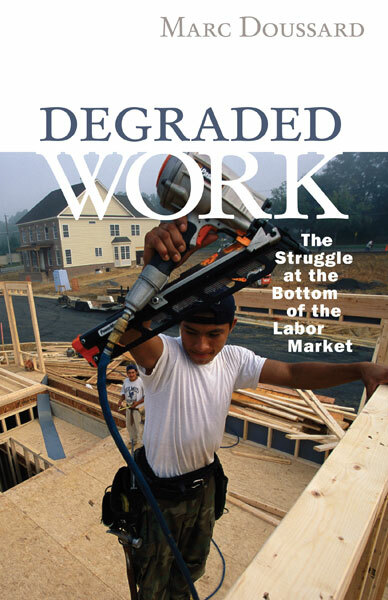 He is author of Degraded Work: The Struggle at the Bottom of the Labor Market, which has received the 2015 Paul Davidoff Award from the Association of Collegiate Schools of Planning. He has worked with community and labor organizations in Chicago and elsewhere since 2000. T.S. Eliot astride a John Deere tractor. Photo remix by David S. Roh. What does T.S. Eliot have in common with a John Deere tractor? Quite a bit, as it turns out. 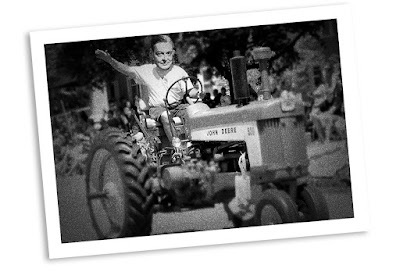 The John Deere company (owned by General Motors) recently set the blogosphere ablaze when it filed a claim with the U.S. Copyright Office arguing that, in effect, the farmers of America don’t own their tractors, they’re just licensing them. Thanks to a controversial clause in the 1998 Digital Millennium Copyright Act—written and passed at the height of industrial panic over file-sharing technologies and peer-to-peer protocols—any product that has software embedded within its systems can in fact be claimed as off-limits from modification. The crux of John Deere’s argument is that since the company owns the patents to the software system integrated into new models of tractors, they in fact own the tractor in perpetuity. Similar to the logic of computer software on your operating system (you purchase a license, not the software itself), the DMCA grants a bundle of rights to the licensee and licensing body. Therefore, as software becomes more integral to the latest model of automobiles, owners will find themselves stripped of rights that they previously enjoyed. For example, weekend hobbyists will no longer have a right to tinker or modify their cars with impunity, since that might be considered “circumvention” or alteration beyond the parameters laid out by GM’s legal team. What makes this example particularly egregious is that it runs counter to the individuated do-it-yourself culture of farming and our very American ideals of property rights and self-reliance. So how does this relate to T. S. Eliot? Eliot’s estate was once known to claim absolute ownership of his work, going as far as denying scholars and critics access to his poetry in scholarly studies. Critics who were interested, for example, in exploring some of Eliot’s more controversial papers or positing a thesis running counter to the Eliot estates’ wishes might find themselves locked out from his papers. As Jonathan Bate has pointed out, the consequences are quite real: Peter Ackroyd’s biography of Eliot is notable for its distinct lack of quotations and overabundance of paraphrase; Ackroyd explains in his preface that the Eliot estate has denied him from quoting extensively. It was only when the Eliot estate decided to adopt a less draconian policy that scholars began to write more liberally about his work; subsequently, Eliot’s reputation and institutionalization in the Modernist canon is now considered beyond dispute. Common to both scenarios is the stifling of technological and cultural development. Farmers who purchase John Deere tractors expect that they’re free to tinker with the machinery and repair or modify it as they see fit, depending on the particulars of their situation. The idea of the John Deere company wielding a stranglehold on how they can manipulate the material object thanks to an obscure copyright clause seems counterintuitive at best; a gross violation of property rights at worst. Likewise, scholars toiling away on a lonely monograph generate new ideas based on a body of work that has seeped into the cultural consciousness. Implied in the statutory and social contract between artists and the public is the understanding that there is a commons from which everyone should eventually have the freedom to draw. Creative works are granted a monopoly for limited times and then are supposed to turn over to the public domain; but even during periods of monopoly, the fair use clause gives wide latitude for critical commentary. Cultural critics want to tinker with the material that has already returned to the cultural commons. The problem is, those goods aren’t going anywhere. Intellectual property law, in its byzantine and oftentimes hamfisted manner, has become so broad that it supersedes the principles of creative incentives, thereby creating counterintuitive scenarios—such as tractors that you cannot own, let alone modify, thanks to software code embedded within the machinery. Or, in the realm of literary studies, only being allowed to quote 1.7 syllables of a 17-syllable haiku, thanks to an absurd ten percent rule (which doesn’t exist in statutory form). Our expensive litigation system skews in favor of the copyright holders; upstarts often wilt under pressure. You can credit this kind of madness to two things: our cultural reverence for solitary genius, and our state and corporate paranoia over unregulated information exchange—best manifested in digital networks. Both have led to overreaches in intellectual property law, granting copyright holders (not necessarily the original creators) de facto veto power over subsequent artists and denying ownership of material objects through licensing schemes. Thankfully, a countermovement is brewing that has caused some backtracking by the more brazen copyright abusers. John Deere, stung by the negative publicity, have put out a statement clarifying their claims of pure ownership. The Eliot estate long ago abandoned its scorched earth campaign against literary critics, much to its—as well as literary culture’s—benefit. I’d argue that another reason for the pushback after so many years of unmitigated copyright expansion is cultural. Thanks to a mode of cultural creativity that operates according to the free exchange of information and knowledge, facilitated by the modern network, artists, and indeed, even some content owners themselves, are beginning to see the value in the freedom to tinker with both technology and culture. It is a narrow and small world indeed if the John Deeres and literary estates of the world can dictate the future of creativity. Instead, we should encourage a multiplicity of voices to create a symphonic chorus. David S. Roh is author of Illegal Literature: Toward a Disruptive Creativity and coeditor of Techno-Orientalism: Imagining Asia in Speculative Fiction, History, and Media. He is assistant professor of digital humanities and Asian American literature at the University of Utah. More information: www.davidsroh.com and @drdr78. 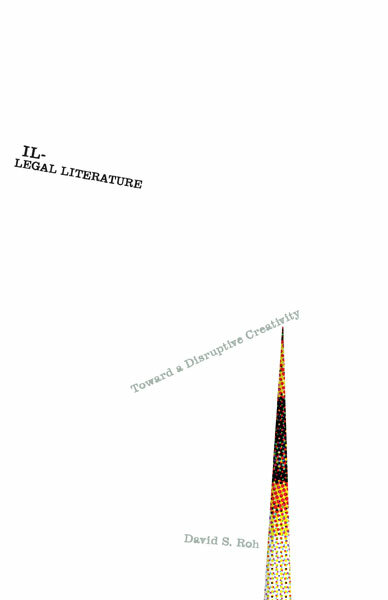 "Illegal Literature is a clear headed look at the copyright protections surrounding authorship and the combined legal, material, and aesthetic construction of authorship over the modern period." in East New York as a mass transit hub—but at what cost to the rest of the neighborhood? 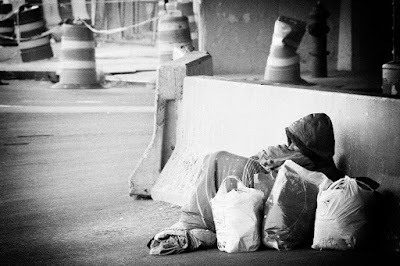 A recent article in the Wall Street Journal publicized new efforts by New York City Mayor Bill de Blasio to curb rising rates of homelessness. Citing a city study that found 32% of families arrived in shelters from evictions, the mayor will increase funding for public attorneys to represent tenants facing eviction in Housing Court. As the Wall Street Journal reported, while the city currently funds that program at $34 million, it would be up to $60 million annually by 2017. City support for eviction defense is hard to argue against. But at best, the program is a stopgap that will slow the flow of people from homes to shelters. Eviction defense does nothing to address the root causes of housing insecurity that produce vulnerability to eviction among New York’s poor and working classes, predominantly populations of color. But the de Blasio Housing Court plan is not only shortsighted; it is doomed by the Mayor’s other plans. Back in February of this year, the Mayor’s office unveiled its $41 billion Zoning for Quality and Affordability program. While touted as a means to preserve and expand affordable housing, the plan would lift height restrictions for developers, allowing for more luxury apartment buildings. Furthermore, rezoning efforts—which would convert commercial districts to residential corridors for these new high-rise developments—target neighborhoods that are currently low-income and predominantly Black, such as the East New York neighborhood of Brooklyn. City subsidies would require new construction projects to allocate twenty percent of units as affordable. Housing activists have raised concerns regarding the lack of clarity about how rents and income requirements would be determined. In especially economically disenfranchised neighborhoods like East New York, the incomes of current residents can fall below the Area Median Incomes often used to determine rent ranges. So while new units might be below market, they might be above what families already in neighborhoods like East New York can afford. The introduction of thousands of new units of exorbitant “market price” apartments will deeply and irrevocably change these neighborhoods. De Blasio has been clear that he is interested in East New York as a mass transit hub that could draw higher-income residents into what has been thought of, by gentrifiers and developers alike, as the far reaches of Brooklyn. It would be absurd to imagine that this new housing stock and new residents will leave the rest of the neighborhood untouched. Traditional models of gentrification imagine a slow, piecemeal process in which a new class of renters with limited means is slowly recruited into neighborhoods; Neil Smith referred to them as the “foot soldiers of gentrification.” De Blasio’s development-driven model brings much more rapid displacement as, almost overnight, hundreds if not thousands of new, mostly white, higher-income renters arrive in a neighborhood. This development-driven model has been aggressively pursued in Washington, D.C., which saw many predominantly Black neighborhoods go from white populations of less than ten percent to fifty percent between the 2000 and 2010 censuses. The Zoning for Quality and Affordability plan will in fact increase housing insecurity and vulnerability in the neighborhoods it targets. And it will do so under the guise and rhetoric of “doing good.” In my book, I describe this as being “rescued into abandonment.” And thus, with one hand the mayor pours money into the housing court system, claiming to protect tenants facing eviction, and with the other pours money into the development and construction industries, ramping up and fortifying the forces producing eviction in the first place. The Wall Street Journal article notes that 84% of families in the New York City shelter system already receive obviously inadequate cash benefits from the city. What good is a lawyer who may help postpone an eviction if New Yorkers lack the means to pay rent in a city that is actively investing in furthering gentrification? There is of course a long tradition of diverting poor people to court-based solutions; as Anders Corr showed in his book, No Trespassing, the United States imposed a housing court system in Puerto Rico not to protect renters, but to diffuse a growing tenant movement by absorbing its energies into bureaucratized legal battles. In Brooklyn, housing activists see the need for grassroots mobilizing outside the court systems. Residents of Prospect Lefferts Gardens formed the Movement to Protect the People to fight rezoning and redevelopment plans there. At a September 2014 Community Board meeting, that group successfully shut down representatives of City Planning, preventing them from presenting their plans and powerfully demonstrating that any conversation about rezoning was a no-go. Neighboring Equality for Flatbush is doing related work, while building a broad base of support across Brooklyn. Rallying under the call, “Before It’s Gone/Take it Back,” Equality for Flatbush recognizes “redevelopment” as a cover story for real estate speculation and increasing displacement, and that the promise to “do good” through legal programs and rezoning plans is no good at all. 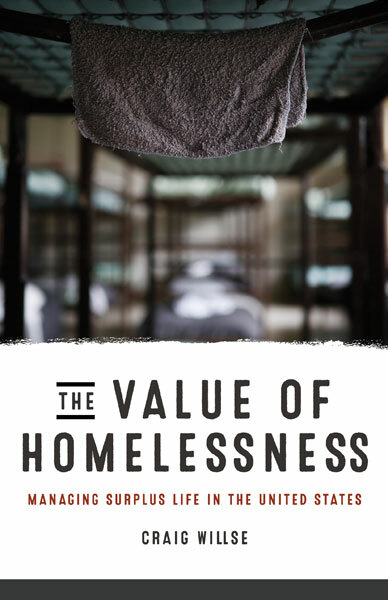 Craig Willse is author of The Value of Homelessness: Managing Surplus Life in the United States. He is assistant professor of cultural studies at George Mason University and coeditor of Beyond Biopolitics: Essays on the Governance of Life and Death.